- These coders fit onto the top of Freezing Tube closures. 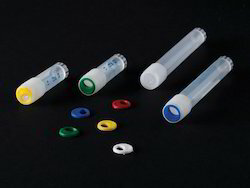 - These provide quick visual identification of specific vials to simplify inventory maintenance. - Available in wide range of colors. We are leading suppliers of Laboratory reagents, Glassware, Disposable poly ware, Filter papers andMicrobiological discs. Other than this, we also offer other Laboratory aided machinery like Hot plate, Incubator, Hot air oven and others. Sourced from leading manufacturers, these can be offered by us in different specifications as demanded by the customers.